This entry was posted on Thursday, November 15th, 2012 at 5:00 am	and is filed under Change, Culture. You can follow any responses to this entry through the RSS 2.0 feed. Both comments and pings are currently closed. I thought I would chime in first and address an aspect of this story that I didn’t mention in the post. 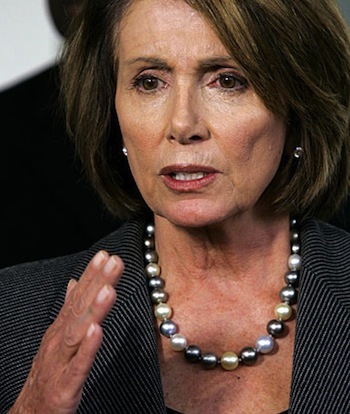 Before citing Russert’s question as offensive, Pelosi pointed out that it has not been asked of Mitch McConnell. In his reiteration of the question Russert includes mention of Representatives Hoyer and Clyburn, which levels the playing field a bit. Nevertheless, if this is a fair question for Pelosi then it should also be asked of McConnell, Clyburn, Hoyer, and Senator Reid. I just wish that she’d fielded the question with less shock and horror, answering it in stride and pointing out along the way that her male colleagues should be asked the same thing. As one who checks a box that contains more than 44, or leaves the box blank altogether, I will say that it is, indeed, offensive. Does anyone ask the men their age? Perhaps so and I’ve simply missed it. Age discrimination – more against women than men – is alive and well. I’m not saying the women in politics should be given a free pass to lie about it, but the offense is properly earned in my opinion. My own resentment at assumptions concerning women and aging is amply documented. 1) I wonder if she’d have had the same knee-jerk response if it had come from an older reporter. 2) I agree that women should have to answer tough questions, but I still don’t know if I think this one was appropriate. I think it’s rare for a man of her age to get asked that question, and it seems just sort of inappropriate and unprofessional to me. I think, in general, women have to defend themselves more than men and prove themselves in so many ways. So to have to defend yourself on something like age probably seemed (to her) like salt in a wound. I do get your point, and don’t think women should be held to different standards…but there is something about the question that bugged me. Can’t quite place it. 3) I wonder if she’d have had the same knee-jerk response if it had come from someone other than Luke Russert, who, immediately upon graduating from college became a correspondent for NBC. As you know, I was a HUGE fan of Tim Russert, but I find it weird and irritating when NBC tromps Luke out as “the young reporter”…I’ve seen this happen a few times and it seems like a weird way of making up for the fact that he didn’t (in my opinion) pay his dues. I’m sure he’s a smart guy and all, but I haven’t found him impressive in interviews, and it sure didn’t seem like he worked his way up to that job. I wonder if all this contributed to her response at all…a privileged young white man questioning her age. Maybe that’s not the case, but just wonderin’.